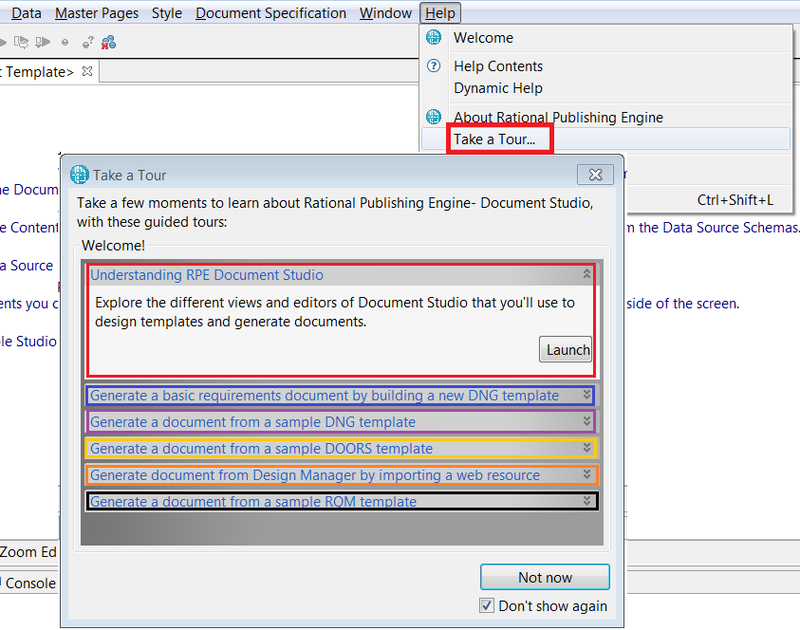 Template assistant in Rational Publishing Engine (RPE) 2.1 and 2.1.1 guides new template designers with a step-by-step walkthrough on building an RPE template and the complete process up to document generation. This interactive studio guide gives a very quick introduction to various parts in RPE Studio. The new guide bar in the template editor allows a new user to go through the template assistant and allows the user to follow the steps in the pop up. Guide View provides detailed instruction for further assistance to build the template, configure the data sources and generate the final document. Take a look at the video on studio bar template assistant to build a new template. The guide bar can be disabled from the preferences setting RPE > Document Design >Enable Studio guide. For more RPE 2.1 videos, visit the Rational Publishing Engine 2.1 YouTube playlist. In RPE 2.1.1, a number of guided tours help new users understand the different components of RPE Studio, such as building new templates for Rational DOORS Next Generation, using sample “out-of-the-box” templates for Rational Quality Manager and Rational DOORS, drag-and-drop template design for Rational Rhapsody Design Manager, and generating documents by following step-by-step details from the guide view. Check out the following video on using the guide tours in RPE 2.1.1.